Cook rice in water as directed on package. Meanwhile, place cereal in resealable food-storage plastic bag; seal bag and crush with rolling pin or meat mallet (or crush in food processor). In large bowl, place beans; mash with potato masher or fork. Stir in onion, bell pepper, cooked rice, egg, chili powder, cumin, red pepper and 2 tablespoons of the cereal. Shape into 8 patties; coat patties completely with remaining cereal. Spray 10-inch skillet with cooking spray. Cook 4 patties in skillet over medium heat about 10 minutes, turning once, until brown. Remove patties from skillet. Cover and keep warm while cooking remaining patties. 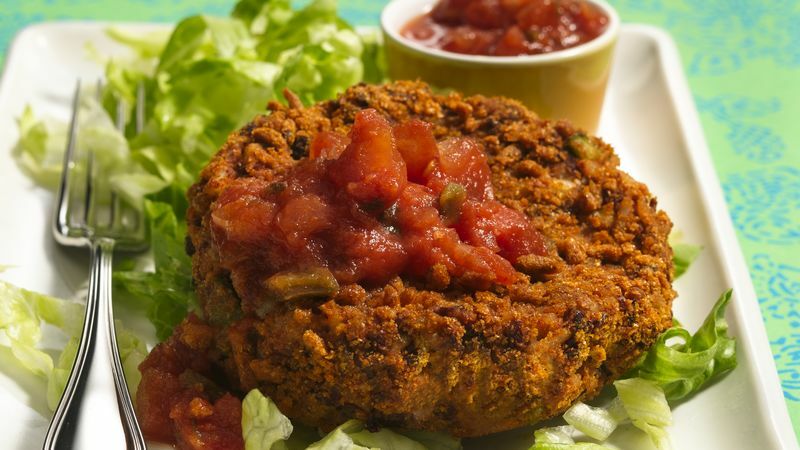 Serve patties on salad greens; top with salsa. Cumin is the dried fruit of a plant in the parsley family. Store it in a cool, dark place.